WATCH: Border Wall Prototypes Destroyed, Making Way For New Fencing Eight steel-and-concrete mock-ups of border wall prototypes were put up near the San Diego-Tijuana border in 2017. They were supposed to represent the "next generation" of border barriers. In 2017 the Trump Administration put up eight border wall prototypes to demonstrate the "next generation" of border barriers. On Wednesday, all but one were demolished. 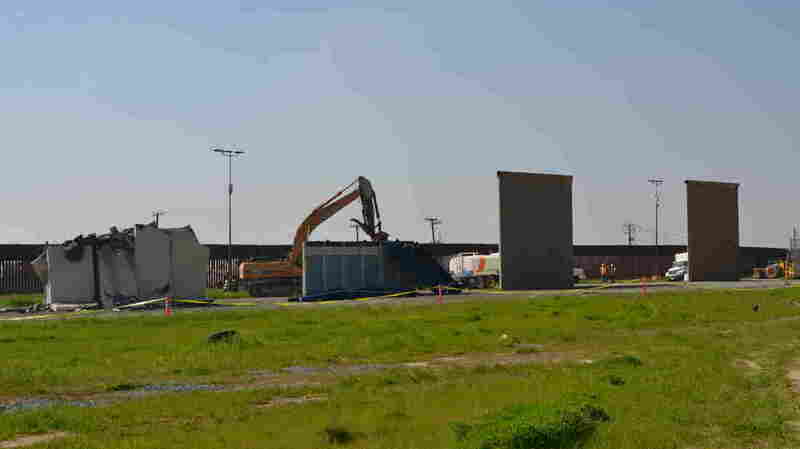 President Trump's highly touted border wall prototypes between San Diego and Tijuana were largely demolished on Wednesday morning to make way for a replacement barrier of secondary fencing based on older designs. U.S. Customs and Border Protection paid $5 million to have eight steel-and-concrete mock-ups erected a few yards from the border with Tijuana, Mexico, in 2017. Reporters from around the world broadcast photos of the imposing, 30-foot-tall prototypes. At the time, border officials said the wall segments represented "the next generation" of barrier that would be resistant to scaling, penetrating and tunneling. Critics called it expensive, militaristic political theater to please the president's build-the-wall supporters. "The prototypes were used as a tool. They used them for different attributes," explained Border Patrol agent Vincent Pirro beside the demolished fencing. "They looked at some of the pros and cons of the prototypes, and they put them in a toolkit. And that's what they're going to use for future wall projects." A team of military and CBP specialists tested each wall segment for characteristics such as breaching, scaling, and aesthetics. KPBS obtained the heavily redacted CBP report and reported in September 2018 that each of the eight prototypes was vulnerable to at least one breaching technique. Demolition crews tore down seven of the eight the prototypes on Wednesday to make way for 14 miles of largely replacement secondary fencing that is under construction to stop illegal crossers from Tijuana. Only one-and-a-half miles of the project will be new wall and not a replacement for an existing fence. "To actually incorporate the new wall with the eight different prototypes would cost a lot more money," said Border Patrol Agent Pirro. The towering prototypes — one topped with steel spikes — made for impressive optics. But Border Patrol officials in South Texas, where 88 miles of new fence construction is currently planned, have been quietly saying they plan to follow the conventional barrier design — 18-foot hollow steel bollards filled with concrete and rebar. The new secondary fence, which is already under construction, will reach at least 30-feet high. Customs and Border Protection plans on completing construction in January 2020.